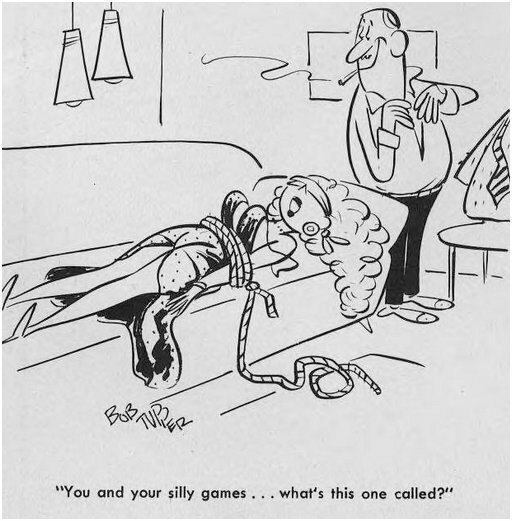 Cartoon is from the April 1960 issue of Adam magazine. Update: Oh, damn, I’ve published this cartoon before. Twice. I have a mind like a steel trap — rusty and lost in the woods. With almost 3,900 posts in the database, it’s gonna happen, especially on visual matter that doesn’t have precise attributions (like a lot of my early posts) that I can search against. But at least this time I have a source listed, so hopefully I won’t publish it a fourth time in 2022. Hopefully. Think of it this way: he’s tied her up like this more than once! Besides, one never gets tired of the classics!